Global Travel Media » Blog Archive » Is this the ultimate Antarctic adventure? Is this the ultimate Antarctic adventure? The champagne is chilled, the ice is broken and Australian travellers have a front seat for this exclusive, bespoke & world-class polar expedition. For the first time ever, the magnificent, privately-owned icebreaker ‘Legend’ has one scheduled departure in January 2019 and cabins are now available for Australian travellers to book. Australians are notorious adventurers and appreciate sophisticated luxury, so it makes perfect sense that they will now be at the forefront of redefining luxury experiences in Antarctica. The Antarctic landscape is as unique as the Legend herself. From the moment you board this impressive superyacht, you will discover the ultimate in refined luxury. From her Class 1 icebreaker capabilities to the 16-seater waterfall spa there is a respectful nod to the nostalgia of cruising. Her warm, sophisticated interior has woven modern conveniences seamlessly and with a guest-to-crew ratio of 1:1 the ‘Legend’ ensures an attentive, personalised expedition. As one of only 26 guests, your Antarctic experience on Legend will be intimate and bespoke in every form. You will witness this remarkable continent, like few have before. Our onboard expedition guides will enrich your experience, sharing their extensive knowledge, research and expertise at every opportunity, so you can fully appreciate the diversity of this unparalleled continent. The ‘Legend’ delivers an unrivalled level of opulence, service and flexibility that, until now, only a select few have been privileged to enjoy. “Guests can hop into a Zodiac, mingle with Humpback whales and linger longer at colonies of parading penguins. Or, enjoy a late breakfast, mimosa and a massage before venturing leisurely ashore. 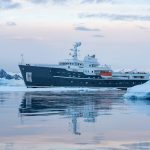 The experience will be theirs to define,” says CEO EYOS Expeditions, Ben Lyons. Offering the convenience and comfort of flying over the notorious Drake Passage, we’ll explore the Antarctic Peninsula over seven full days. Using the complementary fleet of Zodiac’s and kayaks to interact at an intimate level with the polar landscape and wildlife, each adventure will be your own. We anticipate visiting legendary sites like Paradise Bay and the Lemaire Channel and learn first-hand from scientists at Antarctic research stations. Having Antarctica’s pristine environment all to yourself is a genuine privilege only possible on a superyacht, like ‘Legend’. Starting in Punta Arenas, Chile on the 5th January 2019 you will fly into Antarctica, where you join the Legend and her unmistakable ‘expedition spirit’. The voyage includes return charter flights to Antarctica, hotel accommodation in Punta Arenas and all food, drinks and standard excursions onboard. Prices starting from 25,000 Euros per person.